These lesser known authors wrote books that will blow your mind! Hey guys! This week’s Top Ten Tuesday is a freebie, so I decided to one from the past- July 16, 2013, to be specific! I’m only doing two this time, so you know what that means- I’m going to talk. A lot! The whole series is just super interesting and never failed to surprise me. I also read a couple books from her series The Mysterious Matter of I.M. Fine, and I’m looking into getting myself a copy of Saving Sky. Basically, I just think she has a very interesting and unique voice, and I always recommend her, so I definitely think she deserves more attention! 2) Talia Haven– Now, to be fair, the only book that I have read by this author is Mama Cried, which I did a review on fairly recently. However, at less than 100 ratings, this author is extremely overlooked, considering how good her writing is (Don’t underestimate how much emotional content 8 pages can have!). Really, guys, for only 99 cents on Amazon, it’s worth it to check it out (I swear I’m not being paid or anything, I just really loved the story and I love hearing about unknown authors). So, I know that this post was rather short, but I hope you still enjoyed it! 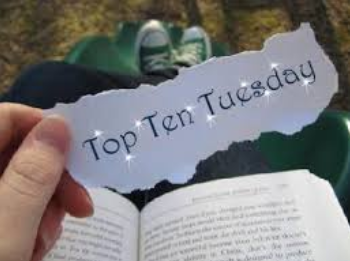 Leave me a link to your Top Ten Tuesday this week in the comments if you did one, or tell me about some unknown authors that you think I should read. 🙂 Have any of you read anything by these authors? ‹ PreviousI’m absolutely delighted to tell you about this awesome Bibliothon! Next ›I’m a certified bumbling buffoon when it comes to books. I haven’t heard of these authors before! Thank you for sharing, I’ll definitely check them out! Thanks for the recommendations, I hadn’t heard of either of them. It’s always wonderful to share your love for lesser known authors. Sometimes you fall in love with a book that’s amazing and it drives you crazy that no one else has read it. Will be checking out these authors, thank you! Oooh, I’m definitely going to have to look into these authors’ work. I love discovering wonderful lesser-known authors and giving them the love they deserve. Excellent post!